Brookgreen Gardens has long been one of the most beloved destinations along the Carolina coast. With over 9,000 acres of pristine botanical gardens, a world-renowned sculpture collection and a tremendous wildlife exhibit featuring a plethora of species native to the lowcountry, locals and visitors alike have flocked to this beautiful refuge for decades. And with the holiday season rapidly approaching, one of Brookgreen Gardens’ most popular events returns as Nights of a Thousand Candles kicks off in early December. For three weekends in December, a dedicated staff of employees and volunteers transforms Brookgreen Gardens into an amazing display of light and Christmas cheer. The Nights of a Thousand Candles festival takes place beginning on Thursday, December 6th, running each of the next three weekends from Thursday to Sunday from 3 PM to 10 PM. 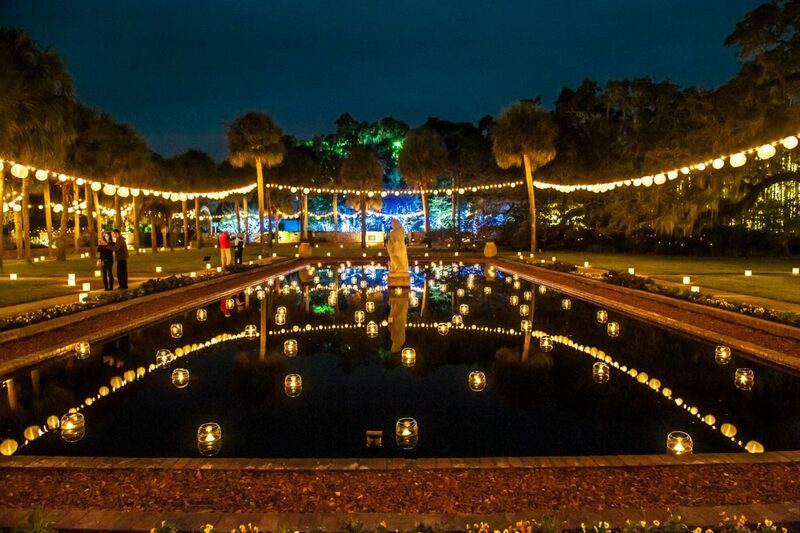 Each night of the festival, the grounds of Brookgreen Gardens will be awash in a warm glow from over 4,500 handlit candles, bathing the scenic botanical gardens in a twinkling aura. Simply walking through this awe-inspiring display will surely fill even the Scroogiest of us with Christmas cheer! In addition to the charming lights, the sounds of holiday music will fill the air as carolers and bell ringers will sing and play Christmas favorites. While you stroll through the area you can grab a cup of apple cider to warm yourself up. This one-of-a-kind festival is a true can’t-miss spectacle, and it’s no wonder why Travel+Leisure magazine named it “Best Christmas Lights in South Carolina”! Best of all, when you book with the Litchfield Company you can take advantage of our Nights of a Thousand Candles special! Book from December 4th to December 24th and you will receive a complimentary admission ticket to Nights of a Thousand Candles at Brookgreen Gardens as well as breakfast passes for two daily at Coastal Dish. This amazing deal is sure to book up quickly, so make plans for a holiday vacation to Pawleys Island today! Whether it’s our cozy suites at Pawleys Plantation, modern two or three bedroom villas at True Blue Resort or deluxe Pawleys Island condos at Litchfield Beach and Golf, we have the perfect accommodations for your trip to Pawleys Island!